Little is known about Arctic killer whale prey preference or behavior, but new research has tried to determine the diet of the Arctic killer whale. It seems to prefer other whales over fish. Killer whales (Orcinus orca) are the top marine predator, wherever they are found, and seem to eat everything from schools of small fish to large baleen whales, over twice their own size. The increase in hunting territories available to killer whales in the Arctic due to climate change and melting sea ice could seriously affect the marine ecosystem balance. 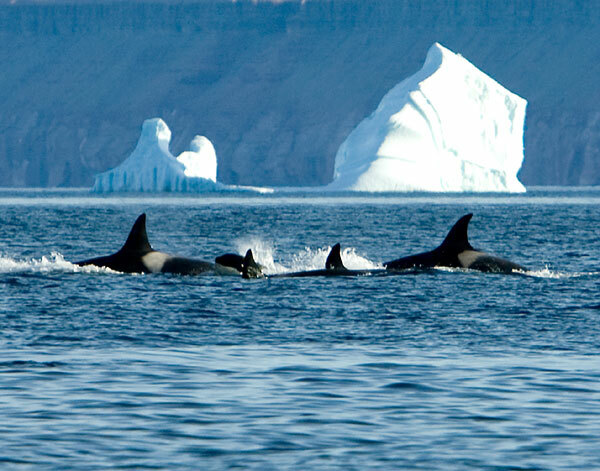 Killer whales in the Arctic. Orcas have been studied extensively in the northeast Pacific ocean, where resident killer whales eat fish, but migrating whales eat marine mammals. Five separate ecotypes in the Antarctic have been identified, each preferring a different type of food, and similar patterns have been found in the Atlantic, tropical Pacific, and Indian oceans. However, little is known about Arctic killer whale prey preference or behavior. Traditional Ecological Knowledge (TEK) is increasingly being used to supplement scientific observations. Researchers from Manitoba visited 11 Canadian Nunavut Inuit communities and collated information from over 100 interviews with hunters and elders. The Inuit reported that killer whales would ‘eat whatever they can catch’, mainly other marine mammals including seals (ringed, harp, bearded, and hooded) and whales (narwhal, beluga and bowhead). However there was no indication that Arctic killer whales ate fish. Only seven of the interviewees suggested that killer whales ate fish, but none of them had ever seen it themselves. The type of reported prey varied between areas. Most incidences of killer whales eating bowhead whales occurred in Foxe Basin and narwhal predation was more frequent around Baffin Island. Inuit were also able to describe first-hand how killer whales hunted, including several reports of how killer whales co-operated to kill the much larger bowhead. During the hunt some whales were seen holding the bowhead’s flippers or tail, others covering its blowhole, and others biting or ramming to cause internal damage. Occasionally dead bowheads, with bite marks and internal injuries but with very little eaten, are found by locals. ‘Aarlirijuk’, the fear of killer whales, influenced prey behavior with smaller mammals seeking refuge in shallow waters or on shore and larger prey running away, diving deep, or attempting to hide among the ice. Even narwhal, which are capable of stabbing a killer whale with their tusks (although this is likely to result in the deaths of both animals), will run to shallow waters and wait until the whales give up.